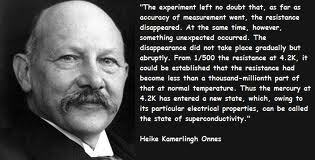 Heike Kamerlingh Onnes (1853-1926) won the Nobel Prize in physics for his work with liquefied helium. Heike Kamerlingh Onnes was a Dutch experimental physicist distinguished for his work in the field of low-temperature physics. He was the first scientist to succeed in liquefying helium, a breakthrough which yielded a previously unattainable degree of cold. This accomplishment won him the 1913 Nobel Prize in physics, in addition to numerous other awards. He is also credited with the discovery of superconductivity--that is, the complete disappearance of electrical resistance in various metals at temperatures approaching absolute zero.